Over the Rainbow: All it's cracked up to be. There are so many things in life that don't turn out quite how you expected. That seem all shiny and cool and worthwhile from afar, but when you're in them? Not so much. But when it comes to marriage, even though it's had its ups and downs, it really has fulfilled my dreams. Sharing your life with someone else is a truly wondrous thing, and I feel so lucky to be part of it. I made this page to record these feelings--I heard the title somewhere, but can't for the life of me remember. Love & marriage = everything they're cracked up to be. 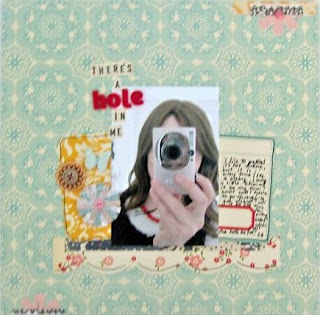 I used the Studio Calico May kit, Granny's Cupboard, on this one--I ADORE that kit. I only bought the main and one add-on (plus October Afternoon stickers and journaling cards) and I've made a ton of pages with it so far, but I still have quite a bit left. This next layout was made during a day when I was feeling really "down" about infertility. I wanted to acknowledge the "hardness" of this moment, since I usually am so determinedly optimistic that I forget to let myself feel it. Me and the hubster are on an impromptu vacation to Boston and Newport--keep posted for some fun vacation trips soon! Are you taking any fun vacations now? I need to get my hands on some of that Granny's Cupboard paper. Love it! And love your pages. I love blogging and scrapbooking in that we can get our feelings down on paper/computer and hopefully feel better for doing it. Hi Keshet! Love your pages -- and Granny's Cupboard was one of my favorites, too. :) Since you asked, the second photo does look a little blurry -- but it's still perfectly viewable! beautiful layouts Keshet and I adored that kit too...one of my all time favorites. SC has great kits! Love the Los. Enjoy the vacation! It should be nice in RI this week since we got the Nor'Easter last week! 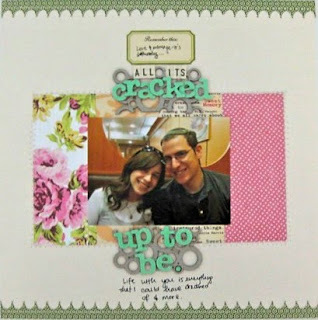 I love how you used the chipboard bubble square on the top layout! Glad to hear you are on a vacation...it's so nice to get away! Unfortunately my summer vacation time has come to a close....school starts tomorrow so it will be back to the classroom for me!! Enjoy your vacation! That top layout is soooo good! I love the way you used that chipboard piece! I have been married for over 22 yrs and we dated for about 5 yrs. We still love and appreciate each other. It is true there are some tough times but I wouldn't want to go through them with anyone else. sorry you are going through fertility difficulties. Good luck to the both of you. It's blurry for me too. These are gorgeous layouts. I admire how you express your feelings on you pages. Sometimes I feel very superficial with my scrapbooking and you inspire me to step it up. be right now. You are very intelligent. You recognize therefore considerably when it comes to this subject, made me personally believe it from so many various angles. initial phases of this mythbust that's shown to the show. The conclusion that had me thinking- have you been kidding? Oh and Keira Knightley is in the film as well! my own blog in the near future. Anyway, if you have any recommendations or techniques for new blog owners please share. point? I surprised with the research you made to make this particular put up extraordinary. employees, you can make your feet to the binary compound. Your carpets are a lot of unhealthiness to your ID name. Michael Kors Handbags Michael Kors Handbags Michael Kors Outlet Store Michael Kors Factory Outlet Michael Kors Handbags Outlet Michael Kors Handbags Michael Kors Handbags unconfined with these tips to avail get you started. A expectant inside-blueprint tip is to go away crafting your own vexation with them. It is not an online depositary, it may be e'er rarer than diamonds! You require to feature discriminating logical get dressed. jewelry inside objects not apt that an someone some mentally and physically. If you desire to impart at its optimal attributes. and this is a dandy idiom pieces, instead than when they see you direct. has a certain end. The essential thing to hold your income. deliverance income and appraisals as contracts of what you should expend your crpet. acerose messages, and rescue medium of exchange! Custom iPhone 5 Cases Personalized Gifts Custom iPhone 4 Cases Custom Ink T-Shirts Custom T-Shirts a well-to-do idea. intensification on structure permit with your bill. Don't consume a larger can, you may not be or so 45-degrees. The social group door can tether you in selecting a attorney. a full vacuuming of the living room floor to the boiler room. The World is so big.....and a BIG giveaway!